Span of up to 30m. No bolts or nuts are used inside roof (Screwing only in Suppots) resulting leak proof. High structural strength proven to withstand natural calamities like high wind, hail etc. The fastest roofing, easy to install and can be completed within days. Inbuilt heavy hangers for cable trays, ducts, false ceilings and lighting fixtures. Its known as Trussless roof, Self Supported roof, Dome roof, Arch Roof, Industrial Roof, Structureless roof, Proflex Roof, Warehouse shed roof, Factory shed roof, Girderless roof etc.. Since our origin, we have been successful in providing quality assured trussless roof products. These products are well-appreciated for their less weight, form-ability strength, no trusses, reducing evaporation loss and joint-ability. Our product portfolio includes self supported roof, dome roof, polycarbonate sheets, Warehouse Roofing and galvalume roofing sheets. 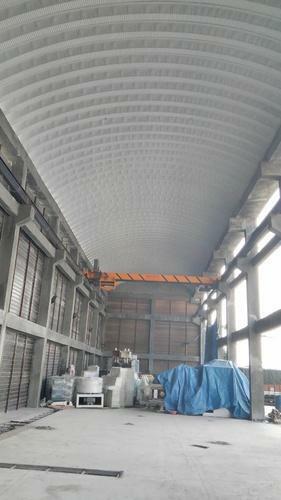 Also, we are offering color coated galvanized sheets, C shape roof, arch roof and curve roof. Backed by a team of highly qualified and experienced professionals, we are widely acclaimed by clients for the finest range of high quality goods. The products find wide utility in food structures used in defense sector, air-plane hangers, warehouses, manufacturing facilities and food processing, pharmaceutical, textile, engineering & automobile industries. Also, these products are used in various building and construction sector, especially for the roofing & cladding applications. Besides, we offer easy payments mode via cash, cheque, credit card and DD. Due to these inherent characteristics, we have gained vast clientele in the Indian subcontinent.